Review Signal is about transforming the opinions people share on twitter into insights for consumers. The goal is to create an up to date picture of a company based on what consumers are saying about them. Our technology is best suited for services and other intangible things because they are difficult to compare and measure. Review Signal measures what we like to call ‘Consumer Happiness’ – the level of satisfaction/endorsement/usage a company has. 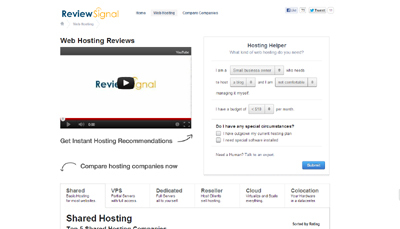 Review Signal currently focuses on web hosting reviews. We chose to start with web hosting reviews because there was a distinct lack of honest reviews sites and it is incredibly difficult to compare a service where everything either works or doesn’t. There is very little middle ground, so unless you have enough data, it’s nearly impossible to accurately measure what consumers really think of a company. Review Signal is hoping to expand into other industries soon. Early 2013 will probably see the introduction of our domain registrar reviews. Review Signal is a re-imagination of what a review site should be. The old model generally falls into 3 categories: expert reviews, user generated reviews and aggregated reviews. Aggregated reviews are just compiling data from the other two kinds of review sites. Expert reviews rely on an individual or group of individuals to provide insights and expertise. User generated reviews require enough people to write opinions on a specific site. Review Signal relies on people just talking and going through their normal routine on social media. It doesn’t require anyone ever coming to Review Signal for it to be entered into the review database. Review Signal makes sense of the conversations already happening all over social media. It has more data by an order of magnitude or two compared to any of its competitors in the web hosting review space.